Forget about that for now. You don’t need to have seen the other film to fully enjoy this one, and, besides, the latest one is just a helluva lot better. 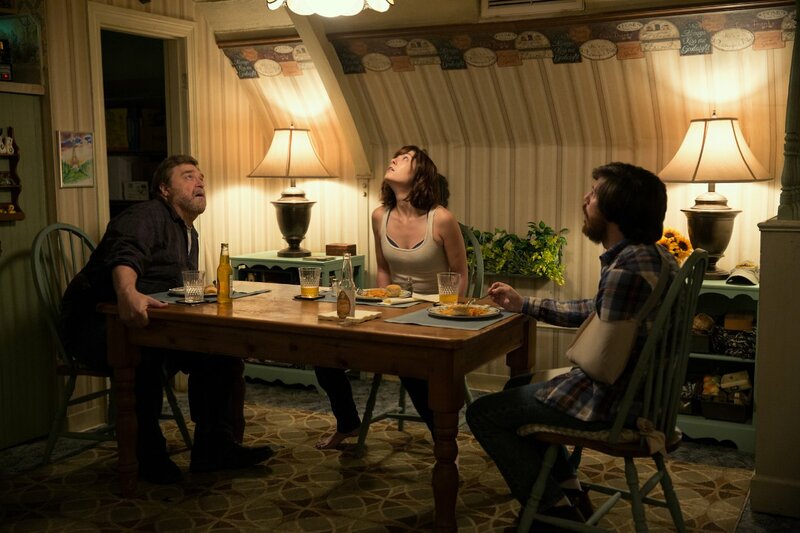 In fact, 10 Cloverfield Lane is just about the best genre movie you’re likely to see this year. Right down to the batshit crazy third act, 10 Cloverfield Lane is pure drive-in fun. If it weren’t for Abrams involvement behind the camera, and John Goodman’s presence in front of it, this one might have slipped right to iTunes and VOD, and that would have been an absolute shame. Director Dan Trachtenberg had no track record, but he now had one incredible audition tape to get a franchise gig his next time out. Handed a neat twist (or two) on a familiar premise by the screenwriting trio of Josh Campbell, Matthew Stuecken, and Damien Chapelle, Trachtenberg delivers a tight, suspenseful film that teases exploitation while shimmying between horror, thriller, and sci-fi. A young woman (Mary Elizabeth Winstead) wakes up from a car accident chained to a bed in an underground bunker. Her savior/abductor (Goodman) says they can’t leave because there’s been an attack – chemical or nuclear – by unknown forces – Russians or Martians. There you have it – except you don’t. It’s never “either or” in 10 Cloverfield Lane. You might think that you only have to figure out whether Howard, the conspiracy spouting survivalist who had his cement lair custom made, is telling the truth, but the resolution is not so simple. For one thing, there’s the matter of the third person on the scene, Emmett (John Gallagher, Jr.) who tells Michelle that he fought his way inside after witnessing the onset of the attack. And there’s the person who shows up at the door. Why does Howard keep talking about still another young woman who’s not around anymore? And the noises and vibrations that are coming from aboveground seem to indicate that something is going on upstairs, but is it the routine of normal life or a ground assault? This movie is one of those you need to get to before it’s spoiled for you. Don’t go to the cinema looking for drama or tragedy or gritty realism or insight to the human condition. This one is for the night you want a good visceral thrill. Manage your expectations, willingly suspend your disbelief, and enjoy.